One of the things that makes StarCraft such an exciting game is the intense strain it puts onto the hearts of its players. If you've only played games casually and never cared about the winner, you may find it surprising that a computer game can make you sweat. You may find it more surprising still that you don't need the high APM of a progamer for a computer game to make you sweat. What makes a player sweat is his or her heartbeat. When I say this game puts strain on your heart, I mean it it both literally and figuratively. A long time ago when Lost Temple was the only map most people played on, and WGTour was still a site people went to, I saw a post of WGTour that said StarEdit.net was a great mapping site looking to expand its horizons with a new melee map making section. The Campaign Editor had been one of my favourite things about StarCraft since it came out, and I'd been interested in getting better at melee StarCraft for a little while then. I made maps, I looked at other peoples maps, I commented and talked with people on the forums, but as with most StarCraft map making forums, discussions about maps devolved very quickly into theorycraft and arguments about balance. The fortunate thing was that back then, you could actually say 'ok, prove it. Let's play some games and see if your theorycraft is true.' This actually made it fun, but at the same time, as you commented on more people's maps you started attracting more and more attention and being required to play games to prove your skill and ability to comment on maps. This is where emotion comes in. You've built up a persona, people think you know what you're talking about, and if you lose like a total noob everything is going to come crashing down and you'll be proven for the fraud you are! Well, I couldn't have that, of course. I knew I was better than b net pubs back then (at least the ones that said 'noobs only'). Hell, I knew that making multiple barracks to increase production was important! And I had the micro I'd developed from playing all those random micro wars UMSes that used to be popular. I had some confidence in my abilities, but I wanted an edge too. I studied Tsunami's Zerg Strategy guide and emulated everything it said. I watched replays galore. I faced the challengers of StarEdit.net with my pride on the line. Since I had something to prove every game I played, I tried very hard. When you only hotkey units (thx tsunami) and you are trying to remember everything you've theorycrafted that you always wanted to try, even playing at 60-70 APM can be intense. Thankfully, the challengers of StarEdit.net were not the greatest players you'd ever met. To give you some measure of our skills, I had trouble playing at the lowest ranks of PGTour back then, I got burrow and queens every game... But in any case, 60-70 APM with some game understanding was about 100x better than the 15 APM majority which populated StarEdit.net. On that playing field, we were the top tier, the S-class, the guys who you should listen to when making a map because we could beat you 100-0 no problem. It wasn't enough to win one or two games though. I felt I had to maintain that rank. I became very good friends/rivals with a player named Yenku, and we must have played 1000 ZvPs on all manner of maps. One game in particular that I remember was the first time we'd ever had an observer. This observer made really good maps, and I wasn't buddy buddy with him so I'd have no excuses. That game ended up being a 40 minute ZvP with tonnes of plagues, my mouse scrolling everywhere, huge armies, multiple fronts... Believe me when I say that even though our APMs were 80 in that game (I remember the details vividly), I had sweat rolling down my face nearly the whole game. The glow of my CRT monitor only exacerbated the heat. I don't think I'd ever played harder vs Yenku in my life. Today I watched a classic game that was uploaded to Nevake. Midas vs Boxer, played in 2006 on R-Point. This game is the reason I wanted to make this post. It reminded me of the intensity of that game I'd played with Yenku. A long, grueling game (as many TvTs can be), where both players are desperate to win, to prove that they are the best. Big names that people care about with reputations that need to maintained. Thirty minutes in, what were these players thinking, desperately moving their screens, looking for the next opportunity to take a lead? I could feel it, even though the strategy was barbaric, the action was slow. Two people. Man vs Man. Both of them want to win so badly. 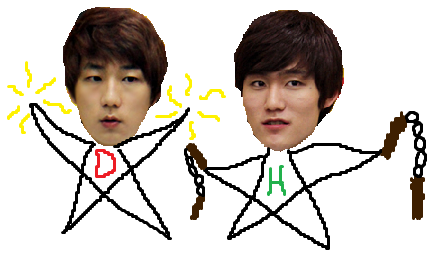 Jaedong is my bishie right now—my favourite player, the guy I root for. Everyone's got eyes on him and he can feel it. In his interviews he apologises for his performance, and says that he hasn't been feeling well lately (and yet he is #1 on our powerrank). Excuses such as his health, and the poor weather are things I don't think Jaedong feels are good enough, however. Just like if one complains about lag, or a poor mouse, people do not judge you less harshly. In an era with Flash, Bisu, and Stork combined, Jaedong is fighting as hard as he can for the number one spot. He passes a ro8, and he still frowns. He will not be satisfied until he surpasses everyone, and can truly claim the title of #1 which lies tauntingly just out of his grasp. For awhile it was hard to choose. I've gone thru periods of cheering for Bisu, Flash, and a few other players, but I think I with Jaedong for the long run now. Ever since I saw him play vs Snow, I've known that inside Jaedong there is a fire and a passion which makes this game interesting. When I watched Hydra play versus Mind, I wasn't sold on who I wanted to win. On the one hand, Hydra beat Jaedong's ZvZ last year. Jaedong has beat Flash's TvZ. The ideal situation for Jaedong would probably be versus Mind. However, I'm never one to cheer for people based on such situations. The reality was that I liked Hydra better for a lot of reasons. It's undeniable that CJ has blood on its hands. The player they are best known for, even to this day, is SaviOr—Ma Bonjwa. The man at the center of the match fixing controversy (regardless of actual liability), who slumped for years, and who left the CJ team with a profound sense of shame. Thankfully in the midst of the controversy Effort was able to regain some pride for CJ with an OSL win over Flash, but he quickly retired and CJ was once again in a state of identity crisis. To lay it out simply, Savior was the first legendary CJ Zerg. Effort was looking like the second (even though he was never dominant), and now Hydra is the third. Compared to Effort, Hydra really does look like he has what it takes to move into the S-Class, if he can only fix his ZvT. But then, wasn't it just a matter of Jaedong fixing his ZvP way back in one fateful final with Stork? Hydra has everything on his shoulders right now. The pride of his team, a steady career to prove he is not a flash in the pan... There is romance in the air, TeamLiquid, and right now these two players seem to be the most intense. it has always been easy to be a cj fan. their team has produced some amazing players. with the fall of the iris/xellos/savior/much group, it was a given that the new line, movie/skyhigh/effort would take their place. their proleague success, though plentiful, failed to reach the heights of a final. movie had a great run to the osl finals, but was just outclassed by flash. effort was one of the hottest players during his rise, but fell off the map shortly thereafter. it wasnt until the re re re re games that effort hit his groove. each round in that osl was a battle for him. he didnt dominate, he did what he had to do to win. coming back from 0-2 down against flash was the pinnacle of his determination. and it must have taken a toll on him. the newest generation, with snow and hydra, show immense promise. snow's bo5 loss to jaedong was some of the best pvz games weve seen in a long time. and hydra, destroying the proleague, bossed his way through jaedong and claimed the finals victory. hydra is the future of the team. he is the enigma. nobody knows what this guy is capable of, and it is clear that even with a finals victory, he is still improving, day in and day out. this series against flash will be the biggest test of his career. will he be able to elevate himself, to transcend flash's dominance and his own zvt shortcomings, like effort, or will he flounder, like movie. only time will tell, but its damn exciting to be a cj fan right now. Chef you play zerg in SC1? I've been a big fan of Zero for awhile now. Ever since I heard he had high APM he's reminded me of Nada The fact that he has done a lot of queen play and has raised Soulkey (who actually kinda looks like him...) in the same way is pretty cool, and makes their proleague matches enjoyable. Zero seems to play much harder vs top tier players than he does vs mediocre players, and so he drops a lot of games he shouldn't be to mediocre players. Zero is an interesting and creative player, but he needs to stay motivated for all his matches, not just the big ticket ones.